Growing-up, one of my favourite ways to eat vegetables was with my mom’s homemade cheese sauce. She would simply melt some butter (1 to 2 Tablespoons), add flour to soak up the butter (paste like) and then whisk in milk (1 to 2 cups) until the flour was mixed in. She would then put it on medium heat (stirring constantly to avoid scorching) until the mixture thickened. She would then add grated cheddar until desired cheesiness was achieved. She often add dill as well as salt and pepper. My mom would serve the cheese sauce over cabbage, cauliflower or steamed broccoli. Knowing how much I loved this growing-up, I was intrigued when I found Jamie Oliver’s recipe for the Best Cauliflower and Broccoli Cheese ever. I really enjoyed this recipe and will definitely make it again. However, I happened to have frozen veggies on hand and he suggested it was a great option. I think the moisture in the cauliflower may have “watered it down” a bit. Next time I will use fresh and I think it will be superb. It makes a nice potluck dish or side dish to serve for company. 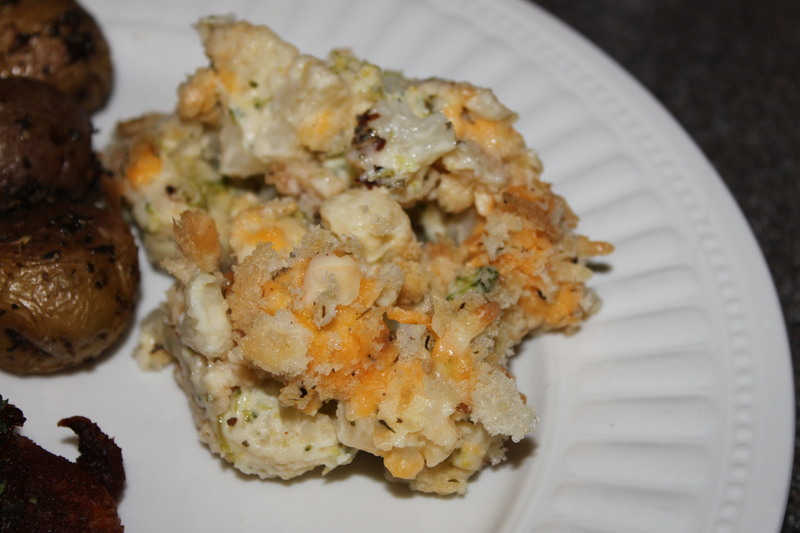 Posted on June 18, 2014 by Cindy Roy •	This entry was posted in Recipes, Salads & Vegetables and tagged broccoli and cauliflower casserole, broccoli and cheese sauce, broccoli cauliflower cheese, homemade broccoli cheese. Bookmark the permalink.